Please note this promotion ended 1st February 2019. You can still use your Love2shop card if you have received one. 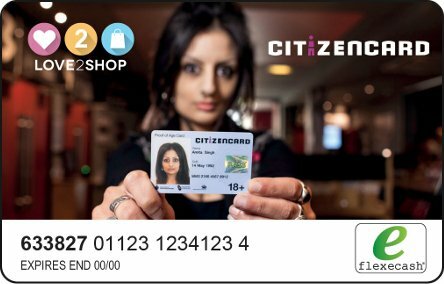 CitizenCard has teamed up with Love2shop giving you 7% off loads onto your free Love2Shop card so there’s more to spend in-store. The Love2shop card can be used as a method of payment and the discount is already on your card when you use it. Every time you load money onto your Love2shop card you get 7% off. That means that if you load £10 you get £10.70 to spend and if you load £100 you get £107 to spend - perfect for when you want to make a big or small purchase. Minimum card top up is £10. The one off £1.50 fee is charged the first time that you load money onto your card. If you load your card by credit card, there is 2% fee of the amount loaded subject to a minimum charge of £1.00. £10 issuance fee is applicable, but only charged if there is balance left on final day of card validity. The Love2shop app is available on Google Play Store® and Apple App Store®. Full Love2shop card terms and conditions can be found here. The Financial Services Compensation Scheme does not apply to the Love2shop card. Flexecash® is the pre-paid card platform which issues Love2shop cards. This facility is provided by Park Card Services who are Authorised and Regulated by the Financial Conduct Authority to issue electronic money (FRN: 900016).